There’s a lot of talk in education these days about “wicked problems”—problems that defy traditional expectations or knowledge, problems that evolve over time: Zika, ISIS, political discourse in the era of social media. To prepare students for such wicked problems, they need to have wicked competencies, the ability to respond easily and on the fly to complex challenges. Unfortunately, a traditional education that focuses on content and skills often fails to achieve this sense of wickedness. Students memorize for the test, prepare for the paper, practice the various algorithms over and over again—but when the parameters or dynamics of the test or the paper or the equation change, students are often at a loss for how to adjust. This is a course design book centered on the idea that the goal in the college classroom—in all classrooms, all the time—is to develop students who are not just loaded with content, but capable of using that content in thoughtful, deliberate ways to make the world a better place. Achieving this goal requires a top-to-bottom reconsideration of courses, including student learning goals, text selection and course structure, day-to-day pedagogies, and assignment and project design. Creating Wicked Students takes readers through each step of the process, providing multiple examples at each stage, while always encouraging instructors to consider concepts and exercises in light of their own courses and students. "Paul Hanstedt is a teacher’s teacher. He approaches the college classroom with a combination of excitement, experience, skill, and humor. His goal – to create 'wicked' students, ready to face the daunting challenges of the twenty-first century – is right on point. And his strategies and recommendations are clear, practical and instructive. I can’t wait to share this highly readable and valuable book with my colleagues." "A must-read for anyone who cares about educating the next generation of change agents. Hanstedt combines practical advice for all college teachers committed to learning outcomes that will help students thrive post-graduation with a thoughtful analysis of what our true jobs as educators should be in a world that is in flux, deeply inequitable, but also in need of many more wicked problem-solvers." "Hanstedt’s conversational tone conjures feelings of sitting with a colleague sharing ideas, brainstorming, and exchanging stories over coffee with lots of laughs. At first, I didn’t want to participate in the “Designing Your Course” sections. But by the first “Intermission” I was so inspired I was engaging in all activities, ideas pouring out as if attending a great conference. Hanstedt uses his own wicked design within his book, resulting in an overwhelming sense of authority for the reader, indeed demonstrating the power of wickedness." "Creating Wicked Students places faculty members in the role of engaged learners where the skillful Dr. Paul Hanstedt guides them to construct curricula, courses and assignments that will prepare students to participate in the world in active and constructive ways. Faculty readers become Dr. Hanstedt’s 'wicked students,' equipped to transfer the skills practiced in this book to challenge their own students to do their best work." "Hanstedt’s Creating Wicked Students is, as they say in Boston, “wicked good”—a clear, clever, and creative step-by-step guide to creating courses that help shape students who are ready to engage with and make a positive impact on the world in which we live." "This book could be useful as an introduction to course design for someone less familiar with the fundamentals, such as how to develop measurable learning outcomes, align course goals with institutional goals, nest content within higher-order goals, engage students’ prior knowledge, or incorporate applied learning. The structure of the book allows for one to follow it step-by-step as a course design manual, and it also includes recursive 'intermissions' to encourage reflection along the way. In addition, his discussion of how to prompt critical thinking through multiple-choice exams offers helpful strategies for encouraging students to explain their thinking on ambiguous questions with follow-up questions that explain or justify their choice." 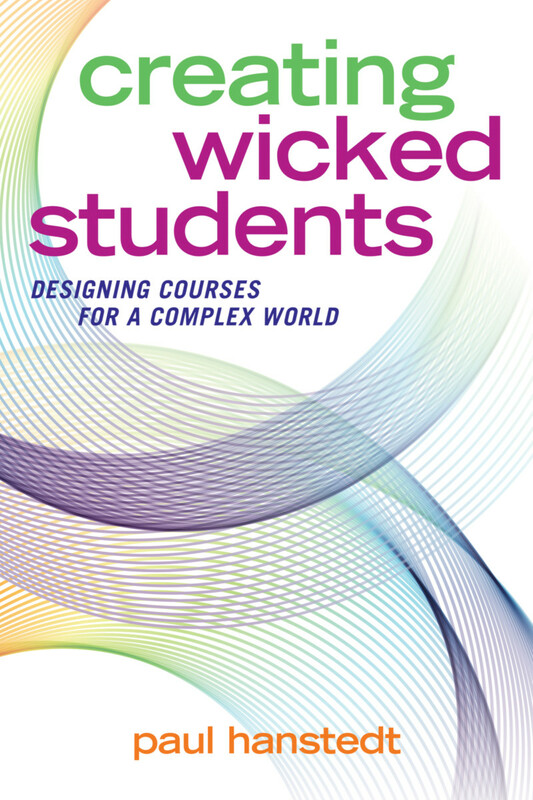 "From its playful title to its final chapter, Creating Wicked Students offers a thought-provoking new approach to course design focused on helping college students develop the abilities and self-authorship needed to work –and live—meaningfully. Hanstedt guides the reader through a design process for courses where students learn skills and content, but more significantly, develop 'the ability to step into a complex, messy world and interact with that world in thoughtful and productive ways'." Paul Hanstedt is the Director of Pedagogical Innovation at Roanoke College, where, among other things, he has led the revision of a campus-wide general education program, developed an innovative writing-across-the-curriculum program, coordinated the implementation of the college’s e-portfolio system, digitized a national literary journal and taught a wide range of courses. He is a faculty member for the AAC&U Institute on General Education and Assessment and the recipient of several teaching awards, including a 2013 State Council for Higher Education in Virginia Outstanding Faculty Award, and the 2014 CASE Carnegie Virginia Professor of the Year. He has received a Fulbright to aid general education curricular revision in Hong Kong, and is co-recipient of a FIPSE grant for sustainable faculty development. He is the author of numerous articles and stories, and two books: Hong Konged, a travel memoir, and General Education Essentials, a faculty introduction to current trends in liberal education.